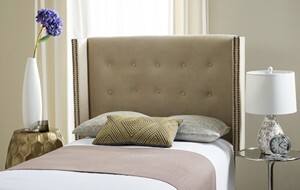 Designed to inspire the art of sleep, this winged headboard is imbued with warmth and timeless beauty. Its plush buckwheat velvet upholstery is generously tufted and finished with classic brass nailhead trim, creating a gentle landscape for relaxation. Dimensions (W*D*H): 45.7" x 8.3" x 53.9"